The LM1875 is a monolithic power amplifier offering very low distortion and high quality performance for consumer audio applications. The LM1875 delivers 20 watts into a 4Ω or 8Ω load on ±25V supplies. 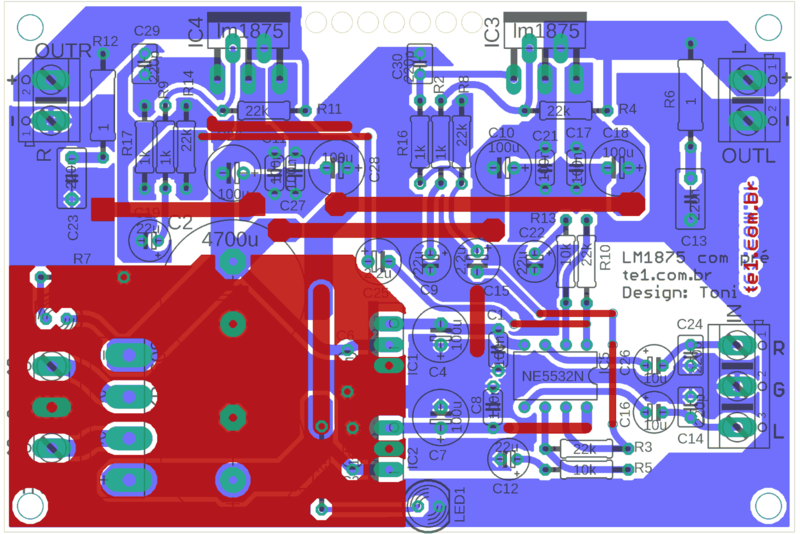 Using an 8Ω load and ±30V supplies, over 30 watts of power may be delivered. The amplifier is designed to operate with a minimum of external components. Device overload protection consists of both internal current limit and thermal shutdown. The LM1875 design takes advantage of advanced circuit techniques and processing to achieve extremely low distortion levels even at high output power levels. Other outstanding features include high gain, fast slew rate and a wide power bandwidth, large output voltage swing, high current capability, and a very wide supply range. The amplifier is internally compensated and stable for gains of 10 or greater. 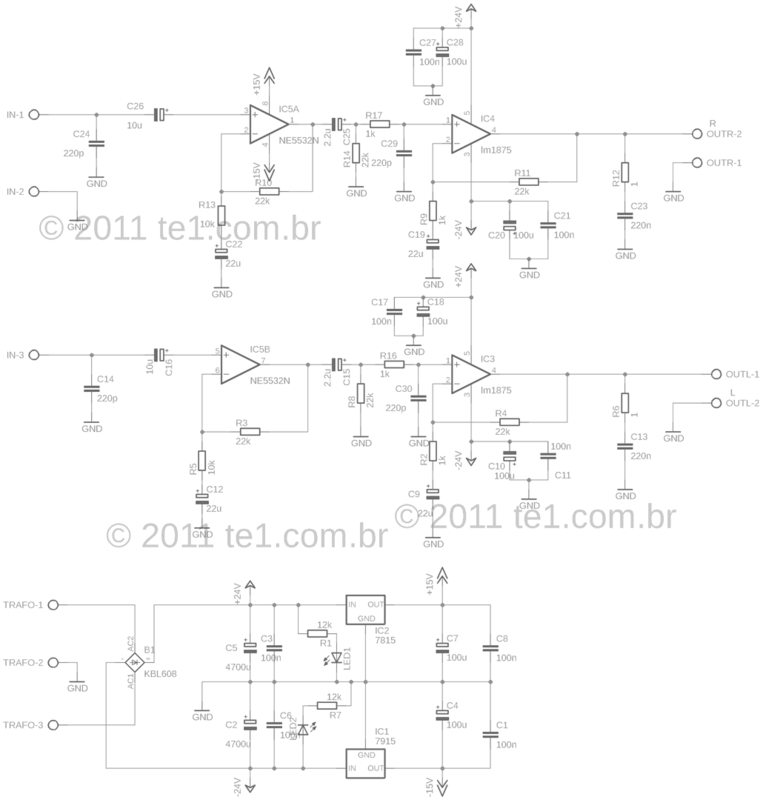 The scheme is simple and can be divided into three parts: Power supply, preamplifier and stereo power amplifier. Power supply: This power supply is symmetrical, easy assembly, the transformer must be 60VA 18-0-18 volts in the secondary to have a maximum of + – 25 volts at the power supply, if you use speakers of 8 ohms can use up to 22 volt transformer and thus will have about 30 watts per channel. B1 is a bridge rectifier that must withstand 100 volts / 4 A, ex: GBU606. The capacitors C2 and C5 can be longer if you prefer, the power supply for the preamplifier circuit is based on the integrated voltage regulators 7815 and 7915, beyond the initial source of the capacitors, there are number of capacitors on supply lines of integrated circuits . 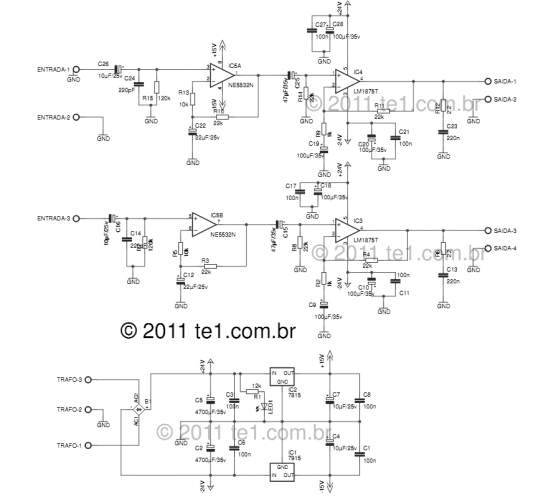 Pre-Amplifier: This circuit is based on double operational amplifier NE5532N. The audio is coupled by C26, until the pin 3 of ic5A is amplified and coupled via C25 to IC4 LM1875. In the right channel is the same thing. 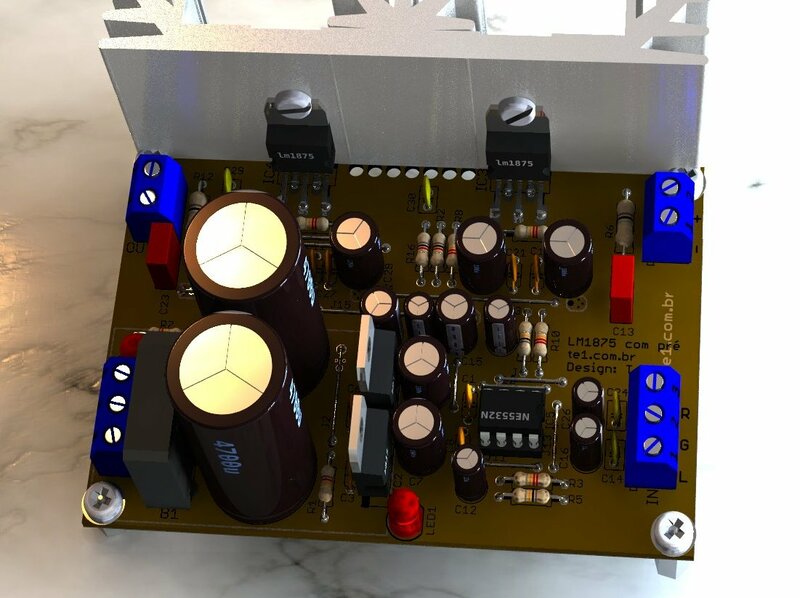 Stereo Power Amplifier: This circuit is based on two integrated circuit LM1875 audio amplifiers that allow amplification of up to 20 watts per channel or 30 Watts maximum @ 8 ohms @ +-30Volts, are connected to speakers 40 Watts RMS. 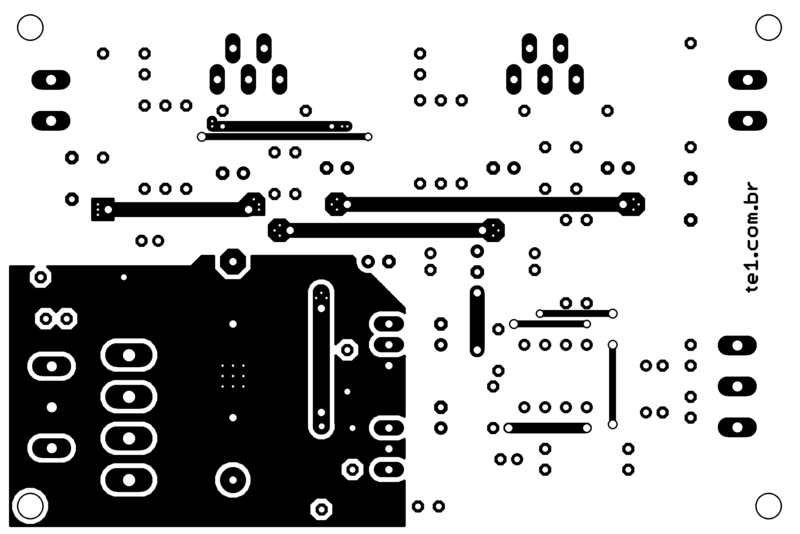 Connection diagram for the components – The next best is XD! 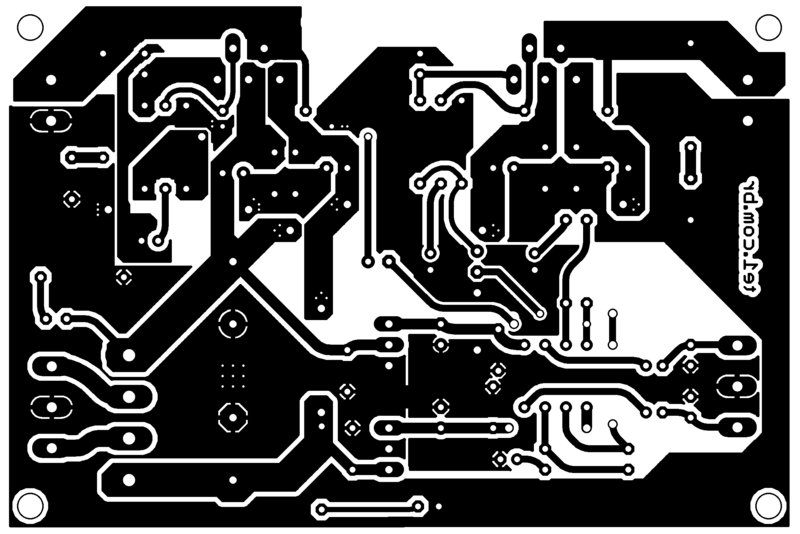 Box, solder, printed circuit board, wires, etc..
Download Circuits files in Eagle PDF: Lm1875 PCB, Schematic, Silk Screen, component side. 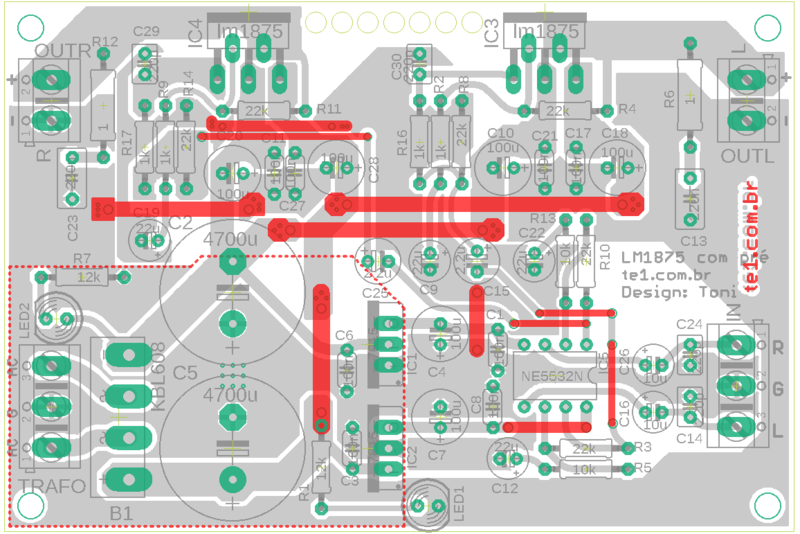 Hey man there’s a mistake, the virtual photo you made of the assembly amplifier is incorrect, all the pcb is in inverted possition, this caused i made the pcb again, please check it! I already bought the components to begin to make it i hope its good!!! 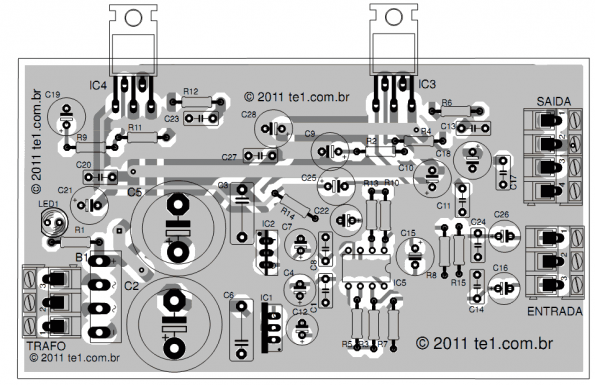 i think schematic feedback on pre-amp is wrong, if you use this there are NO feedback at all.